The British chemicals and pharmaceuticals industries add about GBP 18 billion of value to the UK economy every year, and combined they are the largest exporter of manufactured goods. The chemicals segment accounts for 6.8% of UK gross value added manufacturing, whilst pharmaceuticals contributes 7.7%. Chemicals and chemical products account for about 4.5% of exported goods, while pharmaceutical products represent 8.2% of goods exported. Compared to other sectors business investment is high, at about GBP 4.3 billion in 2017. The chemicals and pharmaceuticals industries mainly comprise small to medium Enterprises (SMEs) and microbusinesses, while a number of major firms are headquartered in the UK. The majority of businesses are mature with a stable customer base, as high entry barriers protect the industries (regulatory requirements and required high capital expenditure). Chemicals contribute to a range of sectors such as aerospace and automotive through the provision of coatings, adhesives, rubbers and plastics. It also provides intermediary ingredients to pharmaceuticals, cosmetics, agrochemical, personal care, paint and home care sectors. The pharmaceutical sector is part of a global industry in which the UK is a leading European market and producer. A large number of chemicals businesses rely on asset-based finance for financing. In most cases profit levels are sufficient to cover the interest. Bank financing facilities are adequate, and business refinancing does not appear to be a problem. On average, payments in the British chemicals sector take between 60 days and 90 days. Payment experience has been very good over the past couple of years, and the level of protracted payments is low. The number of non-payment and insolvency cases was low in 2017 and 2016, and this trend should largely remain unchanged in 2018. 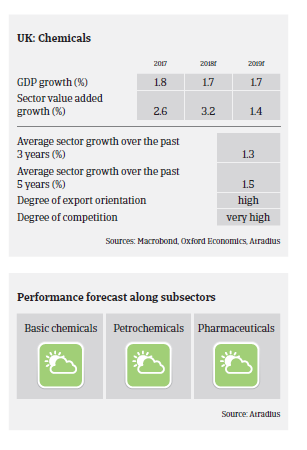 For the time being our underwriting approach to the chemicals sector remains generally positive for all major subsectors (basic chemicals, petrochemicals, fine and specialty chemicals). The same accounts for the pharmaceuticals industry. However, the potential repercussions of Brexit on the domestic economy pose a downside risk for businesses profitability and payment behaviour in the mid-term. Both chemicals and pharmaceuticals are part of a tightly integrated EU supply chain that relies on friction-free transfer of ingredients and finished products. At the same time, the EU accounts for 60% of British chemicals and pharmaceuticals exports.